Horizon Yacht Charters (email) at Nanny Cay, a small owner-operated company, provides first-class bareboat and crewed yacht charters on their immaculately maintained catamarans or monohulls. Featuring tailor-made vacations matching your requirements, whether it's hotel accommodations, stay and sail packages, full or partial provisioning, windsurfer or kayak rentals, learning to sail or dive, or getting married on a beach, Horizon will help you fulfill your dream vacation. brush up on their skills. Horizon works with a travel company to provide discount airfares as well. Le Rive II. The perfect choice for two discerning couples--this centre cockpit yacht has two staterooms each with its own private head/shower. The aft stateroom even boasts a bathtub. Choose Le Rive II for your cruise if you are looking for comfort, luxury and space, as well as a great sail from the Bruce Farr hull and Armel Briand design. She also has extras such as microwave in the galley, and above decks, life is made easy with an electric winch to handle the roller furling mainsail and to furl the genoa. The interior is beautifully appointed in rich finishes--all in all a superior yacht for those seeking the best of both comfort and performance. 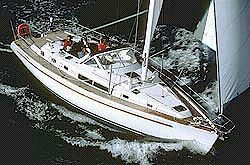 Beneteau 445. No surprise that this design from Bruce Farr wins the BVI Spring Regatta bareboat division year after year. A 14 ft. beam and 5' 9" bulb keel with winglets means loads of canvas carrying ability and masses of space above and below. She goes upwind like a train and watch the speedo click up as you crack off. Despite her spirited performance, she is still very easy to handle, as all control lines and sheets are led to the cockpit. Below, she has 3 double staterooms with ensuite shower and head. Beautiful teak joinery and an abundance of hatches, ports and skylights give her a bright ambience. Whether you are looking for sailing performance or to cruise in luxurious style, the Beneteau 445 offers the best of both worlds.